South Africa is one of the worlds largest gold producing countries. 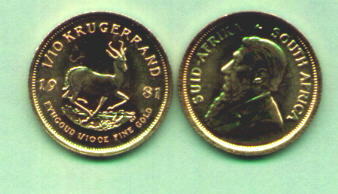 A beautiful antelope - deer design on these genuine gold kruggerand coins. Let us pick you a nice 1/10th oz. almost Uncirculated specimen from the dates we have in stock. Philharmonic and Maple Leaf gold coins. Dates in stock vary. We'll choose you a nice Brilliant Uncirculated (BU) fourth ounce coin from our current inventory of dates in stock. Same design as the other sizes. Prices may change without advance notice. Quantities of some items are limited. Orders shipped to addresses within the USA only. Note: Orders shipped to addresses within the USA only, please.